Homeschooling: Hands On Learning - it's BABY time! Everyone is different in how they learn best. With young children, the best way to teach concepts that they can easily grasp is through hands on learning activities. I like to follow this (to some extent) through various learning materials which my daughter can choose from to encourage her independence skills. This is just my technique, though some children learn better through guided teaching with specific instructions. Here are a few activities you can do with your toddler to encourage learning and developmental skills through fun techniques that are engaging. Teaching through hands on activities has been shown to be quite effective in childhood learning development. It makes sense as children naturally love exploring and discovering their world through their hands. One way to help teach life-skills is by allowing your toddler to help with simple chores such as folding towels, but I’ll save that for a separate post. My daughter loves to help out in the kitchen. Children and knives don’t exactly go hand-in-hand but there is a kid-friendly version that consists of a fruit/veggie basket which lets her ‘help’ mommy while preparing meals. It has wooden fruits and veggies that are pre-sliced with velcro pieces to attach them together and a wooden knife that ‘cuts’ through them. 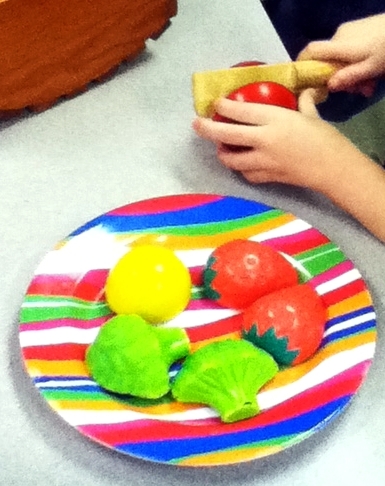 This activity encourages color recognition and identifying different foods. I think it’s so cute that she likes to mimic what I’m doing (which is very typical in toddlers) and there’s a safe way that I can allow her to take part. It also encourages her imaginative play with pretend food. Plus, this set is eco-friendly and all natural with no toxic paints or materials. 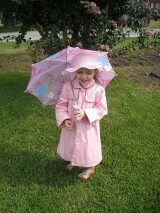 I have a little girl which means tea parties and dress up. What’s great about this is that while she thinks she’s just playing, dressing up into different outfits and costumes actually promotes independence in teaching toddlers how to dress themselves. This is a life-learning skill toddlers should learn before starting kindergarten. Rather than spending lots of money on costumes, just use clothes your child already has in their dresser. Pick out clothes that are easy to put on such as skirts, shorts, dresses or shirts that button up on the front and shoes that are easy to slip on or have velcro straps over the top. Playing dress up helps children develop essential fine motor skills through fastening buttons and shoes. There are a vast number of sorting and matching games available, but another hands-on activity that teaches children these skills while helping out with chores is folding laundry. This is another chore my child loves to do. I’m very particular when it comes to folding clothes, but I let her help out by picking out and sorting socks to match up the pairs. With towels I let her fold the smaller washcloths and hand towels. This activity also teaches fine motor skills as well as matching and identifying colors and patterns. These are additional skills toddlers should learn prior to starting kindergarten. These are pretty simple activities that are still hands-on with some guidance from parents that teach fundamental learning concepts. Here is an easy way for toddlers to learn and recognize the alphabet. 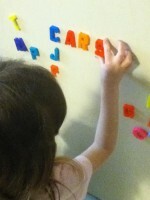 I use alphabet magnets on the refrigerator, a classic, to help my daughter practice letter recognition, sounds, and words through combinations. She is already familiar with her alphabet and recognition so to help her identify and associate the letters with their sounds I make a word combination game (we have two different alphabet magnet sets, which isn’t really necessary but helps to expand word choices) I’ll create a base word with letters that can form a variety of similar-sounding (or rhyming) words. Take car, for instance – I’ll form the base word on the refrigerator then place other letters to the side that can be replaced with the first letter to form new words and we go over the letter sounds and words as she replaces the first letter. Then we’ll add ‘s’ to make them plural and do it again. Here’s a great way to teach geometric shapes using construction paper. 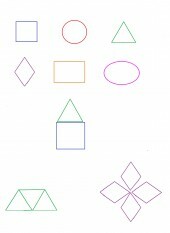 On a white sheet of paper draw different shapes (or you can print out a few sheets of paper using a word processing software for different shape configurations. Then, using different colors of construction paper cut out coordinating shapes (close or around the same size as the ones drawn/printed on the white sheet) Give to your child to match up the construction paper shapes with the ones on the paper. 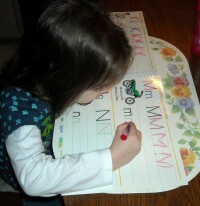 Tracing over letters is an easy way for toddlers and young children to learn writing skills. I love Dollar Tree because they have an entire aisle with teaching supplies (I like to shop their arts and crafts supplies too.) One of the items I like to get are dry-erase books with different lessons including letters that they can trace over with space for them to practice writing letters on their own. You could also make these yourself using a pencil to make dotted letters for tracing on sheets of paper. Write the letter as normal followed by 3 dotted letters and extra space for your child to write their own. Give them a crayon or marker to trace over. *Tip – if using markers make sure you have something underneath the paper to protect surfaces from the color bleeding through. As I just mentioned I like to shop at the dollar store to find different supplies for crafts and learning projects. Coming up with your own projects doesn’t come naturally to everyone, however. An easier method is to purchase kits that already have pre-planned activities and project ideas with the necessary tools and supplies. There’s one I liked that I found on Amazon by Alex Toys that is filled with tons of crafts and learning projects you can use to entertain and teach various skills. Children learn through play and these are some fun activities that can teach key skills through hands on learning techniques that will help prepare them for real-life strategies.